In early childhood education, it is very likely that the first painting activity kids have is finger painting. 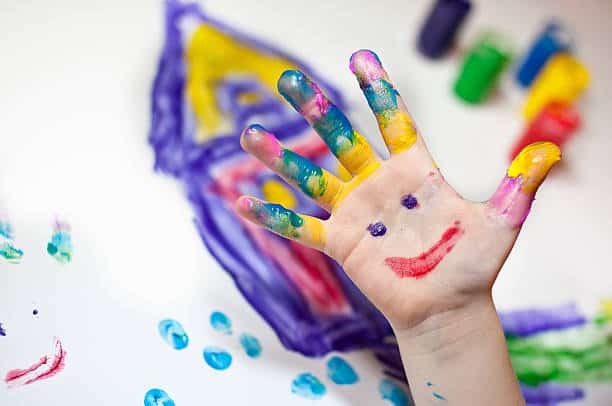 Though it involves simply putting paint into some containers for small fingers to paint with, there are many reasons why finger painting is important for learning and child development. Finger painting is an art that has been used for many years. A lot of artists in the past and present day have used their finger to paint masterpieces. Ruth Faison Shaw is the woman who introduced finger painting in the USA. She had a strong belief that finger painting would be beneficial in art therapy. You can choose to either buy finger paint from the store or make some at home. It is best that you purchase washable finger paints as they won't stick on the kids' fingers. To make some finger paint at home, you can mix two cups of flour with 2 tablespoons of salt. Add two and a half cups of cold water and beat the mixture till it's smooth. Slowly add 2 cups of hot water and boil until the mixture is clear. Afterwards, divide the resulting mixture by putting it on different containers. Finally, add different colors of food coloring. Children go through different developmental milestones. Young children are still developing important motor skills and finger painting may just help them. 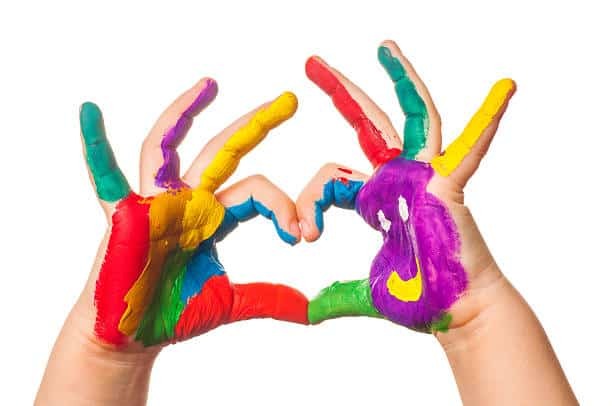 Below we take a look at the numerous benefits of finger painting for kids. Finger painting is an easier activity for small fingers, which are not yet prepared to handle a paint brush. The kids have a sensory experience of studying paints, prints and textures. This activity is beneficial to motor development. By finger painting, the fingers and hand muscles develop to prepare for writing skills. Children learn how to recognize colors and the art of combining and exploring colors. All the 5 senses are utilized: sight, smell, hearing, touch, and taste (if you're using edible paint). Kids get to master hand-eye coordination. Finger painting allows small children to experiment and explore paint. When the children finger paint on a paper that is placed on the floor, there is improvement of large muscles control and balance. There is more concentration on the process, rather than on the end result. This activity enhances creativity, imagination and self-expression. Kids get to develop their language when there is talk of the creativity process, what they're painting and the colors used. It is an opportunity for children to learn that they can change and control their environment. Being a messy activity makes it fun. As you can see, finger painting has numerous benefits. 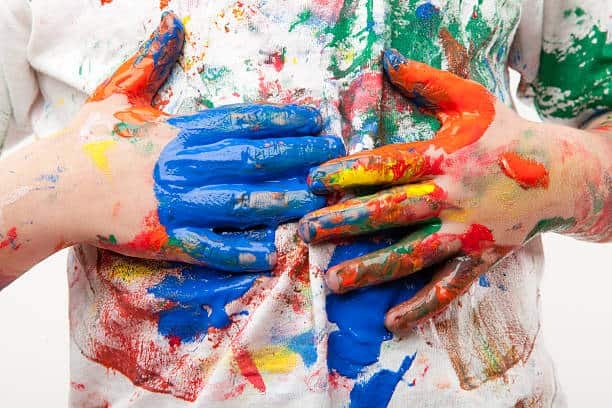 Therefore, as a parent, let your kids get messy as they finger paint. Carry out these activities with them at home and you'll see how their small faces light up. There are so many things kids can do with finger paint. For example, the kids can draw a composition using a pencil (e.g. a bowl of fruit). Trace it over using a permanent marker, and finally proceed to finger paint the drawing. If the colors of the finger paint being used are limited, try to mix the colors to create new ones. Also, by placing sufficient amounts of paint on a container, the kids can paint a rainbow. They can put small amounts of paint, every color of the rainbow (Red, Orange, Yellow, Green, Blue, Indigo and Violet) on a piece of paper and mix them together using their fingers. Kids can also make drawings, words, shapes or patterns in the paint on a container and put a white paper over the top to form an imprint of the drawing. In addition to those activities, kids can also: create roads with many colors, feel the paint with their hands, paint their bodies, experiment by mixing colors, get messy, or cover their toy cars with paint prior to driving them through a painted road. To conclude,finger painting is not only fun for kids, but also for grownups. Parents can bond with their small children by finger painting together. This activity is beneficial to the development of particular skills in young children.